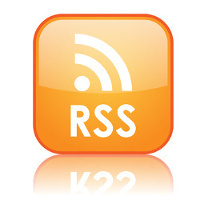 This podcast features my friend Daniel Pinchbeck as our guest speaker. As you know, Daniel wrote a book titled “2012: The Return of Quetzalcoatl”, also, he is widely known as a speaker and writer about many things psychedelic and esoteric. However, I know him best as a fellow alumnus of the Entheobotany Seminars at Palenque, where Terence McKenna and his merry band of psychonauts would hold forth each January. 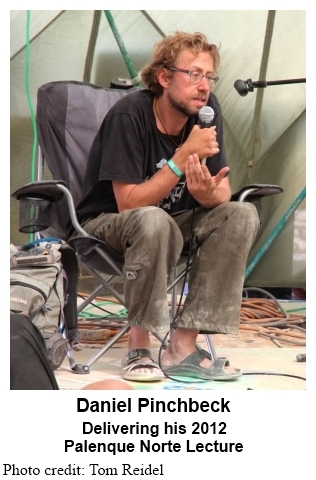 In this talk, one that he gave at the Palenque Norte lectures during the 2012 Burning Man festival, Daniel follows the format of other psychedelic luminaries and lets the audience guide the direction of the lecture through their questions. Among other topics that Daniel covers are 2012, consciousness, the Occupy Movement, and possibilities for the future. 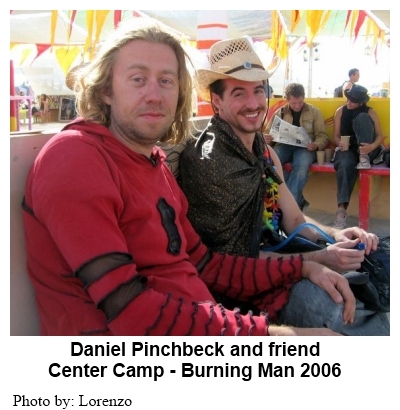 Posted in 2012, Burning Man, Consciousness, Culture, Daniel Pinchbeck, Dennis McKenna, Future, Mayan, Myth, Palenque, Palenque Norte, Psychedelics. I’d been waiting to hear more about how Daniel was adjusting his hypotheses. I don’t mean that in a derogatory way. 🙂 Terence adjusted his. That is a sign of sanity and balance. There is no doubt in my mind that Daniel has a bright future in the Tribe. He is very intelligent and driven. Honestly, though, even I thought there’d be at least *something* happening this year. Zip. And I’m a rationalist in most regards. It has been a good lesson to learn. Strange times we live in…they will be studied intensely in future I think.